Thank you so much for your business and please know we want your complete satisfaction. It can be surprising when the age result doesn’t match what you had expected but don’t fear we are committed to quality and accuracy. The main reason an age doesn’t line up is that it is a young deer with poorly defined cementum lines. Deer less than 3.5 do have “fuzzy” lines or intermediate lines that can be mistaken for cementum lines causing them to age older. 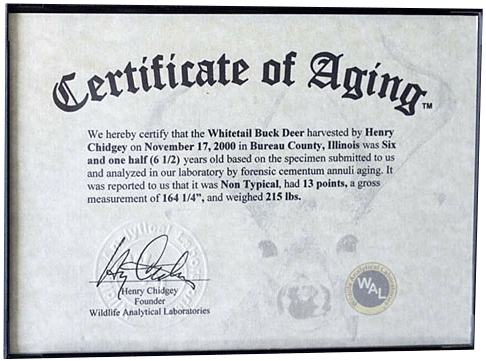 The second reason is when an older deer ages much younger. This can occur for a variety of reasons and is much less common as cementum annuli aging is very accurate with older (4.5+) animals. When you complete this form we will look at your slide again and determine if we feel there was an error made or if the slide needs re-stained. If so you will be notified that we are processing the slide again or a second tooth at our expense. If, however the age appears to be accurate with what we reported and you would still like the second tooth to be done you will have the option to have that done at a cost of $10.95. If you would like to skip the second analysis and have us automatically do the second tooth ($10.95) simply CLICK HERE. Please fill out the form below and we will be in touch with you within 1 week of receiving your request. You are welcome to describe why you feel the reported age varies from expected and we will take it into consideration when analyzing the results again.